Whatever your politics, you’re not likely to feel great about America right now. After all, there’s Ferguson (the whole world was watching! ), an increasingly unpopular president, a Congress whose approval ratings make the president look like a rock star, rising poverty, weakening wages, and a growing inequality gap just to start what could be a long list. Abroad, from Libya and Ukraine to Iraq and the South China Sea, nothing has been coming up roses for the U.S. Polls reflect a general American gloom, with 71% of the public claiming the country is “on the wrong track.” We have the look of a superpower down on our luck. In the nick of time, riding to the rescue comes something new under the sun: the Islamic State of Iraq and Syria (ISIS), recently renamed Islamic State (IS). It’s a group so extreme that even al-Qaeda rejected it, so brutal that it’s brought back crucifixion, beheading, waterboarding, and amputation, so fanatical that it’s ready to persecute any religious group within range of its weapons, so grimly beyond morality that it’s made the beheading of an innocent American a global propaganda phenomenon. If you’ve got a label that’s really, really bad like genocide or ethnic cleansing, you can probably apply it to ISIS’s actions. Talk about a feel-good feel-bad situation for the leadership of a superpower that’s seen better days! Such threatening evil calls for only one thing, of course: for the United States to step in. It calls for the Obama administration to dispatch the bombers and drones in a slowly expanding air war in Iraq and, sooner or later, possibly Syria. It falls on Washington’s shoulders to organize a new “coalition of the willing” from among various backers and opponents of the Assad regime in Syria, from among those who have armed and funded the extremist rebels in that country, from the ethnic/religious factions in the former Iraq, and from various NATO countries. It calls for Washington to transform Iraq’s leadership (a process no longer termed “regime change”) and elevate a new man capable of reuniting the Shiites, the Sunnis, and the Kurds, now at each other’s throats, into one nation capable of turning back the extremist tide. If not American “boots on the ground,” it calls for proxy ones of various sorts that the U.S. military will naturally have a hand in training, arming, funding, and advising. Facing such evil, what other options could there be? If all of this sounds strangely familiar, it should. Minus a couple of invasions, the steps being considered or already in effect to deal with “the threat of ISIS” are a reasonable summary of the last 13 years of what was once called the Global War on Terror and now has no name at all. New as ISIS may be, a little history is in order, since that group is, at least in part, America’s legacy in the Middle East. In other words, before Washington brings its military power fully to bear on the new “caliphate,” a modest review of the post-9/11 years might be appropriate. Let’s start at the moment when those towers in New York had just come down, thanks to a small group of mostly Saudi hijackers, and almost 3,000 people were dead in the rubble. At that time, it wasn’t hard to convince Americans that there could be nothing worse, in terms of pure evil, than Osama bin Laden and al-Qaeda. Facing such unmatchable evil, the United States officially went to war as it might have against an enemy military power. Under the rubric of the Global War on Terror, the Bush administration launched the unmatchable power of the U.S. military and its paramilitarized intelligence agencies against… well, what? Despite those dramatic videos of al-Qaeda training camps in Afghanistan, that organization had no military force worth the name, and despite what you’ve seen on “Homeland,” no sleeper cells in the U.S. either; nor did it have the ability to mount follow-up operations any time soon. In other words, while the Bush administration talked about “draining the swamp” of terror groups in up to 60 countries, the U.S. military was dispatched against what were essentially will-o’-the-wisps, largely representing Washington’s own conjured fears and fantasies. It was, that is, initially sent against bands of largely inconsequential Islamic extremists, scattered in tiny numbers in the tribal backlands of Afghanistan or Pakistan and, of course, the rudimentary armies of the Taliban. It was, to use a word that George W. Bush let slip only once, something like a “crusade,” something close to a religious war, if not against Islam itself — American officials piously and repeatedly made that clear — then against the idea of a Muslim enemy, as well as against al-Qaeda and the Taliban in Afghanistan, Saddam Hussein in Iraq, and later Muammar Gaddafi in Libya. In each case, Washington mustered a coalition of the willing, ranging from Arab and South or Central Asian states to European ones, sent in air power followed twice by full-scale invasions and occupations, mustered local politicians of our choice in major “nation-building” operations amid much self-promotional talk about democracy, and built up vast new military and security apparatuses, supplying them with billions of dollars in training and arms. Looking back, it’s hard not to think of all of this as a kind of American jihadism, as well as an attempt to establish what might have been considered an American caliphate in the region (though Washington had far kinder descriptive terms for it). In the process, the U.S. effectively dismantled and destroyed state power in each of the three main countries in which it intervened, while ensuring the destabilization of neighboring countries and finally the region itself. In that largely Muslim part of the world, the U.S. left a grim record that we in this country generally tend to discount or forget when we decry the barbarism of others. We are now focused in horror on ISIS’s video of the murder of journalist James Foley, a propaganda document clearly designed to drive Washington over the edge and into more active opposition to that group. We, however, ignore the virtual library of videos and other imagery the U.S. generated, images widely viewed (or heard about and discussed) with no less horror in the Muslim world than ISIS’s imagery is in ours. As a start, there were the infamous “screen saver” images straight out of the Marquis de Sade from Abu Ghraib prison. 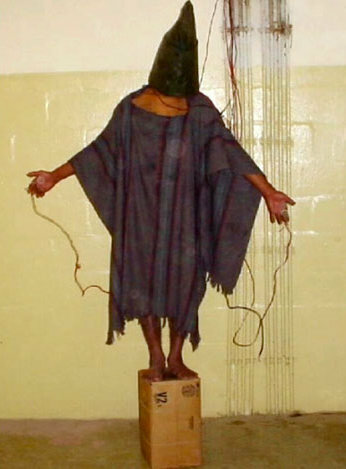 There, Americans tortured and abused Iraqi prisoners, while creating their own iconic version of crucifixion imagery. Then there were the videos that no one (other than insiders) saw, but that everyone heard about. These, the CIA took of the repeated torture and abuse of al-Qaeda suspects in its “black sites.” In 2005, they were destroyed by an official of that agency, lest they be screened in an American court someday. There was also the Apache helicopter video released by WikiLeaks in which American pilots gunned down Iraqi civilians on the streets of Baghdad (including two Reuters correspondents), while on the sound track the crew are heard wisecracking. There was the video of U.S. troops urinating on the bodies of dead Taliban fighters in Afghanistan. There were the trophy photos of body parts brought home by U.S. soldiers. There were the snuff filmsof the victims of Washington’s drone assassination campaigns in the tribal backlands of the planet (or “bug splat,” as the drone pilots came to call the dead from those attacks) and similar footage from helicopter gunships. There was the bin Laden snuff film video from the raid on Abbottabad, Pakistan, of which President Obama reportedly watched a live feed. And that’s only to begin to account for some of the imagery produced by the U.S. since September 2001 from its various adventures in the Greater Middle East. When the U.S. was done, when it had set off the process that led to insurgencies, civil wars, the growth of extremist militias, and the collapse of state structures, it had also guaranteed the rise of something new on Planet Earth: ISIS — as well as of other extremist outfits ranging from the Pakistani Taliban, now challenging the state in certain areas of that country, to Ansar al-Sharia in Libya and al-Qaeda in the Arabian Peninsula in Yemen. When you think about it, from the moment the first bombs began falling on Afghanistan in October 2001 to the present, not a single U.S. military intervention has had anything like its intended effect. Each one has, in time, proven a disaster in its own special way, providing breeding grounds for extremism and producing yet another set of recruitment posters for yet another set of jihadist movements. Looked at in a clear-eyed way, this is what any American military intervention seems to offer such extremist outfits — and ISIS knows it. Five and a half years later, the president is once again under pressure and being criticized by assorted neocons, McCainites, and this time, it seems, the military high command evidently eager to be set loose yet one more time to take out barbarism globally — that is, to up the ante on a losing hand. As in 2009, so today, he’s slowly but surely giving ground. By now, the process of “mission creep” — a term strongly rejected by the Obama administration — is well underway. Americans prefer to believe that all problems have solutions. There may, however, be no obvious or at least immediate solution when it comes to ISIS, an organization based on exclusivity and divisiveness in a region that couldn’t be more divided. On the other hand, as a minority movement that has already alienated so many in the region, left to itself it might with time simply burn out or implode. We don’t know. We can’t know. But we do have reasonable evidence from the past 13 years of what an escalating American military intervention is likely to do: not whatever it is that Washington wants it to do. And keep one thing in mind: if the U.S. were truly capable of destroying or crushing ISIS, as our secretary of state and others are urging, that might prove to be anything but a boon. After all, it was easy enough to think, as Americans did after 9/11, that al-Qaeda was the worst the world of Islamic extremism had to offer. Osama bin Laden’s killing was presented to us as an ultimate triumph over Islamic terror. But ISIS lives and breathes and grows, and across the Greater Middle East Islamic extremist organizations are gaining membership and traction in ways that should illuminate just what the war on terror has really delivered. The fact that we can’t now imagine what might be worse than ISIS means nothing, given that no one in our world could imagine ISIS before it sprang into being. The American record in these last 13 years is a shameful one. Do it again should not be an option. Tom Engelhardt is a co-founder of the American Empire Project and author of The United States of Fear as well as a history of the Cold War, The End of Victory Culture. He runs the Nation Institute’s TomDispatch.com. His latest book, to be published in October, is Shadow Government: Surveillance, Secret Wars, and a Global Security State in a Single Superpower World (Haymarket Books). Previous Post How Many Minutes to Midnight? Next Post Oil Is Back!